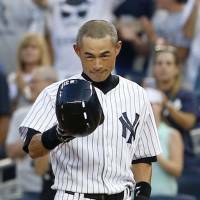 Ichiro Suzuki took off his helmet to reveal a head a little more salt than pepper as he bowed in appreciation of the reception he was receiving after joining an exclusive club with the 4,000th professional hit of his career between Japan and the U.S. at Yankee Stadium. Before Wednesday night, the 4,000-hit list consisted only of the all-time leader Pete Rose (4,256) and Ty Cobb (4,189). It’s not an MLB record nor an NPB record, but it’s worthy of the highest of acknowledgement given how tough a mountain 4,000 professional hits is to climb. According to Brian Hoch of MLB.com, if you included minor league hits, only three additional players, Hank Aaron, Stan Musial and Jigger Statz, would sit among Rose, Cobb and Ichiro. So, instead of the hand-wringing over where Ichiro recorded his hits, appreciate the achievement. Ichiro had 1,278 hits for the Orix BlueWave under manager Akira Ogi, who in 1994 rescued the dynamic young outfielder from the farm team, branded him Ichiro so he would stand out, and fertilized the seeds of history with a little Ogi Magic. The rest have come over 13 years with the Seattle Mariners and New York Yankees. Ichiro’s 4,000th hit was his first off Blue Jays pitcher R.A. Dickey and the 2,722nd of his MLB career, moving him out of a tie with Yankees legend Lou Gehrig for 59th on the all-time list. It’s entirely possible Ichiro would have surpassed 3,085 NPB hits to break Isao Harimoto’s record had he remained in Japan, or made a good run at Rose’s MLB record if he spent his entire career in the majors. Those what ifs can be debated, but not answered. 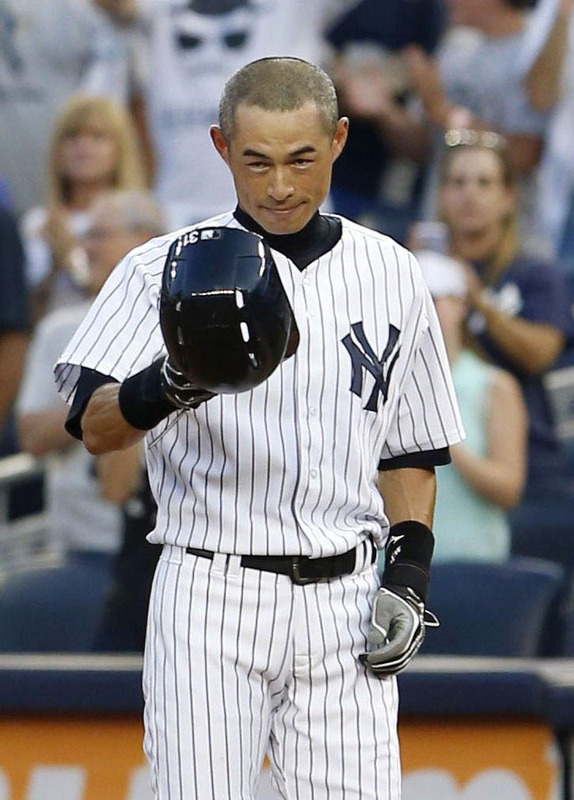 What we do know is that Ichiro has reached one of the biggest round numbers in a game that loves to measure achievements in nice round numbers. If that’s not something to celebrate, then what is? So what if it won’t be in the official MLB record book. It’ll look good as one of the facts on the plaque that will be unveiled on some future Sunday afternoon in Cooperstown, New York. The hand-wringing over whether to count his NPB hits in MLB is an unnecessary one — his Japanese career wasn’t taken into account when he was labeled a “rookie” in 2001, so it shouldn’t be now. Celebrate Ichiro’s mark for what it is, a testament to a remarkable career that’s spanned almost 22 seasons and across two continents. Ichiro won’t knock Rose, MLB’s Hit King, off his throne, but even at age 39 he has a shot at 3,000 major league hits, which would be an incredible feat for a player who took his first slap at an MLB pitch at age 27. Prior to Wednesday’s game, ESPN Stats & Info tweeted that Ichiro had 374 more hits than any other player since his MLB debut in 2001 and the most over a 13-year span in MLB history. In Japan, Ichiro hit .353 with 118 home runs and 529 RBIs in nine seasons. He won consecutive Pacific League MVP Awards from 1994-96 and led the BlueWave to the 1996 Japan Series title. Still, there was considerable doubt surrounding his 2001 move to the Mariners, famously with some of it emanating from Mariners manager Lou Piniella. Ichiro silenced the critics by winning the AL MVP and Rookie of the Year awards in 2001 while recording 242 hits to begin a record string of 10 straight 200-hit seasons. In 2004, he broke the MLB single-season record with 262 hits, which at the time made him the holder of the single-season mark in both Japan and the U.S. — his NPB record of 210, set in 1994, was surpassed by the Hanshin Tigers’ Matt Murton, who finished with 214 in 2010. Ichiro set the NPB record in a 130-game season, which Murton acknowledged at Jingu Stadium after his 211th hit. Dodgers pitcher Hideo Nomo helped pave MLB’s road to the Japanese market in 1995, but it was Ichiro who brought the relationship into the 21st century. He’s grown old in MLB and, along with Hideki Matsui for many years, carried the Japanese baseball flag at a high level long enough for new stars such as Yu Darvish to emerge. Let the other arguments wait until the final chapter of his career is written, and for the present, give Ichiro his due. For now, Ichiro has reached the 4,000-hit milestone. He deserves to at least get a pat on the back without the weight of unnecessary arguments for it.